Perhaps the best fat reducing grill available today is the George Foreman GRP3060P Panini Press. It also comes with a couple options. You can choose either a black lid or platinum lid, helping you find a grill that will match your other kitchen accessories. Of course, there is much more to consider than the color of the grill. Now let’s get into how this grill sets itself apart from the rest of the competition. 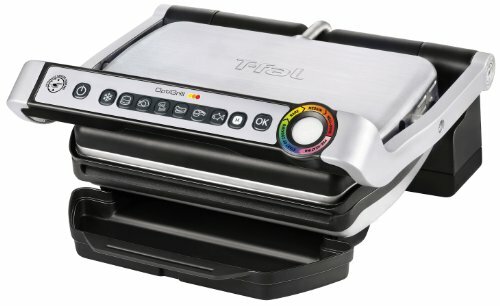 Like all George Foreman grills, this Panini press was made with a unique design that helps the fat drip from the meats. The grill is angled so that the fat slowly slides down into a drip tray as the meat cooks. This sloped cooking surface can remove roughly 42% of the fat, providing you with a healthier meal. The removable cooking plates make cleaning this fat reducing grill much easier than a traditional cooking unit. These detachable plates can be hand washed if you desire, although they are also dishwasher safe. When cleaning by hand, the exclusive non-stick coating makes it easy to wipe off the debris and eliminates the need for butter or oil. These plates are also incredibly durable, to ensure they will last for years to come. Indicator light tells you when the food is ready. Coming in at #2 on this list is the compact Hamilton Beach 25371 indoor grill. Although this grill is on the smaller side, it can cook up to 6 servings at once with its 90-square inch non-stick surface. While there aren’t any temperature controls, this grill is known to cook food fast, especially since you can close the top half of the grill onto the meats so that both sides are being cooked at once. Another advantage is the reasonable price. The main purpose of this grill is for low-fat grilling. Whether you’re cooking steak, hamburgers, chicken, or even bacon, fat is expected to drip right off the meat and into the drip tray. While the drip tray is easy to clean, it might become a little redundant when cleaning the rest of the unit; primarily because the cooking plates don’t come off. So those who own a dishwasher will be disappointed to know that they won’t be able to simply place the plates into the washer. Here is another grill from the George Foreman brand that will give you more freedom to eat healthier, whether you’re inside or outside. Just like all the other George Foreman grills, the GGR50B has exclusive technology that takes it above the rest. The George Tough nonstick coating will last long while holding all the fat that will melt off your meats! This material eliminates the need for butter or cooking oil and can be cleaned easily by wiping the surface down. Cooking for big families will be simple thanks to the large cooking area. 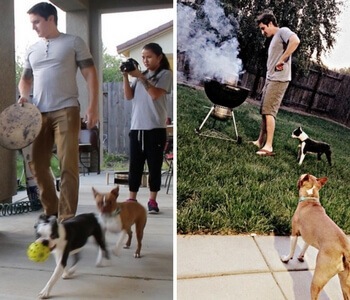 With 240-square inches, this grill can cook up to 15 servings at a time. The adjustable temperature control will help cook your food at the right temperature for you by offering 5 different heat settings. If the George Foreman GGR50B can be described in one word, that word would be: versatile. This grill has a removable stand that can transform it from an outdoor grill to a tabletop grill, so if you like to cook healthy year-round, you’ll be pleased to know that you can use this appliance almost anywhere at any time. This 5-in-1 Griddler from Cuisinart is another versatile indoor grill. 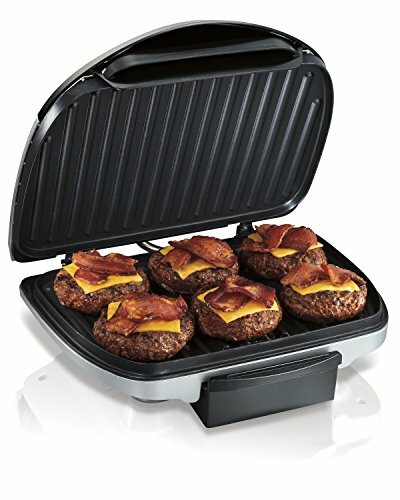 With this grill, you have 5 options: contact grill, panini press, full griddle, full grill, and half grill/half griddle. The removable nonstick plates have two sides: one with a flat surface and the other with ridges that are considered the “grill.” These plates do a fantastic job of draining grease from your meat while it’s cooking so that your food can feel lighter and healthier. Aside from the health benefits of this grill, it is also very easy to use. 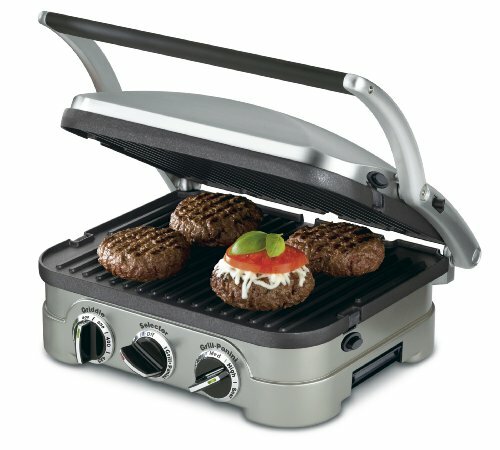 There are three knobs on the front: Griddle, Selector, and Grill-Panini. The Selector knob in the middle is used to choose between the two types of cooking options and the other two knobs are used to control the temperature. Since this is an electric grill, it may take longer to heat up than your outdoor grill. It also may not reach the same temperatures as charcoal grills, but it is a very reliable fat reducing grill, so why not add it to your kitchen arsenal instead of pan frying your food and consuming massive amounts of grease. The T-fal GC702 OptiGrill comes in two sizes to accommodate your cooking needs. The two sizes are made to cook 4 or 8-servings. You will also find 6 automatic cooking options for poultry, burgers, red meat, fish, sausage, and sandwich. These different modes will come in handy when you’re trying to create the perfect lightweight dish. In addition to 6 automatic options, this grill also has 2 cooking modes: a manual mode and a mode used for frozen foods. The manual mode will put you in full control of how your food gets cooked, while the other mode will save you a substantial amount of time when cooking frozen food. Most of the grease will come off your food and head for the drip tray, but if not, don’t worry: cleaning is also easy. The removable nonstick plates will collect fat dripping from the food and can be wiped off easily with a damp cloth or a sponge. If you’ve gone through the list already, you’ll notice that the George Foreman holds two spots on the list. Both the George Foreman GGR50B and the George Foreman GRP3060P are solid options. If you're having trouble choosing a grill, these are both good choices. We all know good health is the key to a longer life. To practice good health, you’ll need to consume food that is considered healthy. By using the best fat reducing grills, you’ll be able to shred a significant amount of fat from each piece of meat. The Hamilton Beach Indoor grill provides the best value for anyone that might be on a budget and still wants an efficient fat reducing grill. It is low priced yet serves a lot of people and will literally melt the fat off your food. It might not look like much, but this grill is an inexpensive product that gets the job done! 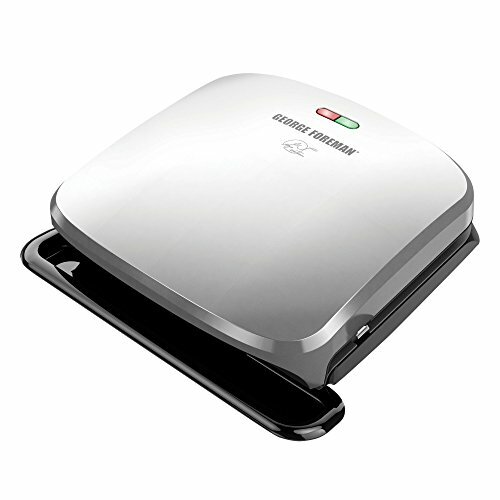 If you want something reliable with a consistent amount of heating power, check out the Cuisinart GR-4N 5-in-1 Griddler. This grill is a great option for a fat reducing grill because it does an exceptional job at separating the fat from the food and into the integrated drip tray and it offers a variety of cooking options. The grills listed are not the only indoor grills to consider. There are ceramic indoor grills that can be used to cook quality meals, though they do not all provide the same fat-reducing effect. While the topic of fat reducing grills sounds straightforward, there is still plenty to know about the subject. Fat reducing grills are much healthier to use for cooking because they don’t retain as much fat as other cooking methods, such as cooking on a frying pan, or in a fryer. In general, grilled food has much less fat content because fat gradually slips off the meat as it cooks. The grills listed above can recreate this effect by utilizing sloped or angled grill plates that allow the fat to slide down and into a drip tray. One advantage of using a fat-reducing indoor grill compared to an outdoor grill is that the fat won't drip into the heat source. In your outdoor grill, the excess fat and grease can cause flare-ups, which may scorch your food or your hands. This is not an issue with an indoor fat-reducing grill, where the grease is collected in the tray. Most of the listed grills feature non-stick grill plates, which are easy to wipe down. There are also a couple options that include removable, dishwasher-safe grill plates. The cleaning process may be easier than using an outdoor grill, but some people love the char-taste provided by outdoor charcoal grills or wood pellet grills. With the use of the right seasoning, you can recreate this flavor. When shopping for a fat-reducing grill, remember to pay attention to the extra features. 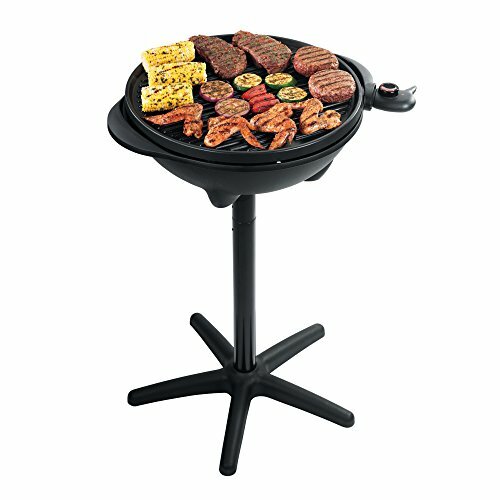 Along with removable grill plates, there are grills that offer additional cooking options. For example, you can find grills that double as griddles. The more cooking options you have, the more use you'll get out of your new grill. The bottom line is that these grills can help you cut down on the fat content of your home-cooked meals. You can enjoy burgers, steak, and other cooked meats without filling your body with unnecessary fats. Don’t settle for grills that will surround your food with unpleasant fatty substances, grab a fat reducing grill so that you can start eating cleaner!